A glance at modern telephone directories will tell you that the Preece name is very prevalent in the general western Midlands area. 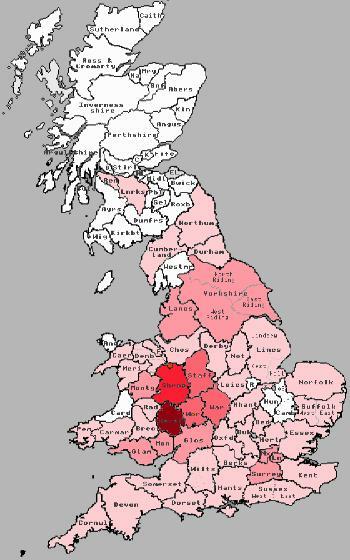 It would also tell you that there are now arguably more Preece families in Wales than 100 years ago, and that there are Preece families in almost every county in England and Wales, and a far greater number in Scotland in 1881. As shown elsewhere, it is widely thought that the Preece name originated in Wales, and spread into the border counties of England, where it retains a large presence today. However, the picture in 1881 was very different. At that time, Herefordshire was home to almost a third of all the Preeces living, With Shropshire weighing in with 15% itself, resulting in almost half of the total in just two counties. Further large concentrations were found in Gloucestershire, Worcestershire, Staffordshire, Warwickshire, and the two Welsh counties of Monmouthshire and Glamorgan. In addition quite a number had moved to London (Middlesex and Surrey) and Cheshire, but outside these counties the numbers were very sparse, reflecting the fact that traveling many miles for work was an exception rather than a rule as far as Preece families were concerned. 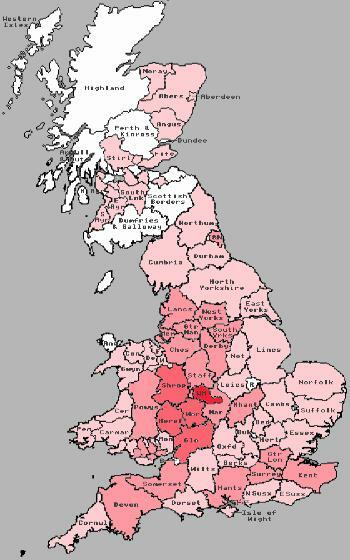 By 1999, the picture had changed, although the majority (around two thirds) still lived within the Western Midlands counties, with most counties having a number of Preece families. There are limitations in the 1999 data, which does affect the overall quality of the data, but the results are sufficient to produce the details required for trends and movement. Since the 1999 data is necessarily extracted from electoral roll lists and telephone directories the figures exclude anyone not appearing in either of these sources, and also fails to count young family members, who will of course be neither in the telephone directory nor old enough to vote! Various estimates have put the figure excluded at up to 20%, meaning that the figures shown for 1999 in the tables which follow could be increased by 20%, but since this would be theoretical I have not acted upon this, but have left the data as extracted. The raw data is shown in the tables which follow, for England, Wales and Scotland. Two maps also follow the tables, showing a graphical representation of the density of the name Preece in the counties in both 1881 and 1999. A further, more detailed look at 1881 has been carried out, taking into account place of birth, and excluding those shown on the census as wives, as they are not originally 'holders' of the Preece name. Click here to view this analysis.